With Ace & Everett, the sociology major found his entrepreneurial groove with a line of design-conscious, made-in-America, organic cotton men's socks. Sage Disch '13 was a Haverford senior when he and his older brother Cody first began envisioning their future as entrepreneurs. They knew they wanted to do something in the fashion world, but it took many months of brainstorming and fashion-industry fact finding before the pair had their "aha!" moment. "We looked out, and we saw there was this great opening," Disch says. And what did they see? Socks. "There were no beautifully designed, high-quality, made-in-America men's socks," he says. "For a guy who has to wear a suit every day, socks are something he can express himself with. We decided to take that concept and really push it." And thus was born the idea for Ace & Everett, maker and purveyor of boldly patterned, brightly colored organic cotton socks for gentlemen. Slogan: "Life is short. Let your ankles speak." In March 2014, barely one year after Disch's graduation, the brothers officially launched the company on the crowdfunding platform Kickstarter, raising $29,000 in seed money for their first production run. Since then, they've introduced three new sock collections, developed a busy online sales site, and created several shrewd marketing campaigns aimed at raising the brand's profile. "We've got market validation," says Disch. "Now we really want to start growing the company." The Ace & Everett name is an homage to the brothers' paternal grandfather, Raymond Everett Disch, Sr. (nickname "Ace"), a natty dresser who built a successful heavy-equipment rental business that he launched with a $5,000 loan. The Disch brothers' dad, Ray Jr., also has an entrepreneurial bent. With their mom, Erica, he opened Triumph Brewery in Princeton, N.J., then got into real estate and started a property management firm. Now he is poised to open Sourland Mountain Spirits, a craft distillery in Hopewell, N.J.
Says Sage Disch, "We've seen the freedom, the enjoyment, and the passion that comes with being an entrepreneur." Cody Disch, a law school grad with a keen interest in art and design, manages the creative end of Ace & Everett, coming up with the concepts for new collections and working with freelance designers to put the patterns into a digital bit map that can be fed into a knitting machine. Those vividly hued designs have a distinctly op-art look, offering intricate variations on the diamond and the zigzag, or resembling a circuit board or a tiled floor. Each pattern gets a name—which often tilts toward the highbrow. Among the styles for sale on the Ace & Everett website: the Warhol, the Poe, the Hemingway, and the Whitman. The socks, which sell for $22 a pair, are made from organic Supima cotton, a trademarked name used to promote products made of Pima cotton. Grown mainly in the U.S., Australia, and Peru, Pima cotton is known for its strength and the fineness of its fiber. "It's the highest-quality cotton you can get in the U.S.," says Disch. Going from design to saleable sock is a multistep process. The raw Supima is purchased from a company that spins the yarn in Georgia. It's then sent to a company in North Carolina, where it is dyed according to the brothers' specifications. Finally, it reaches the Harriss & Covington hosiery mill in High Point, N.C., where it is knit into Ace & Everett socks. "They use a double-cylinder knitting machine, and there are not many mills left in the U.S. that can do that," says Disch. "Most of those machines followed the labor flow overseas." Ace & Everett has developed a relationship with the mill's owners that goes beyond strictly business. "They are a fifth-generation family-owned mill that is run by three brothers," says Disch. "Just like we really care about the product, so do they. The last time we went down to visit the mill, we stayed with Tyler Covington, one of the owners, and hung out with him and his kids." Disch focuses on sales and marketing at Ace & Everett. "I was a sociology major, and for me, from a marketing standpoint, that has been a great foundation for being able to understand people, and to understand the macro view," he says. His marketing efforts have included an attention-getting blend of photo shoot and roving street art performance around Manhattan that featured 50 men in jackets and ties, and Ace & Everett socks—but no pants. "We had a lot of fun with that," says Disch. "When we were first thinking about what we wanted our brand to be, we knew we wanted it to be authentic. Millennials want to know who is making their clothes, and where their food comes from. But we also wanted Ace & Everett to be reflective of us. We wanted it to be comical, lighthearted, creatively driven." The fledgling company has also brought a touch of celebrity to its marketing efforts. To introduce the spring/summer 2015 collection, the brothers enlisted street artist Humza Deas, a daredevil 18-year-old Instagram star from Brooklyn who has gained fame for scaling bridges and buildings to capture his arresting photos. For Ace & Everett, Deas went up in a helicopter and photographed his feet, clad in the company's socks, dangling high above landmark Manhattan locations. That season also marked the first collaboration for Ace & Everett, which worked with Deas to create his signature sock, the "Humzilla," inspired by the view of New York from above. For the new fall/winter collection, Disch, who was a lacrosse player at Haverford, recruited New York Lizards lacrosse star Rob Pannell as a sock model. In recent months, the brothers have launched into growth mode. They've moved beyond online sales only and are now wholesaling their socks to 18 boutique locations. They're also developing a subscription sales option for avid sock buyers, and are working on a new channel of distribution, making custom socks for schools and universities. Disch, who had been working for a consulting firm since he left Haverford, quit that job in April to devote himself full-time to Ace & Everett. 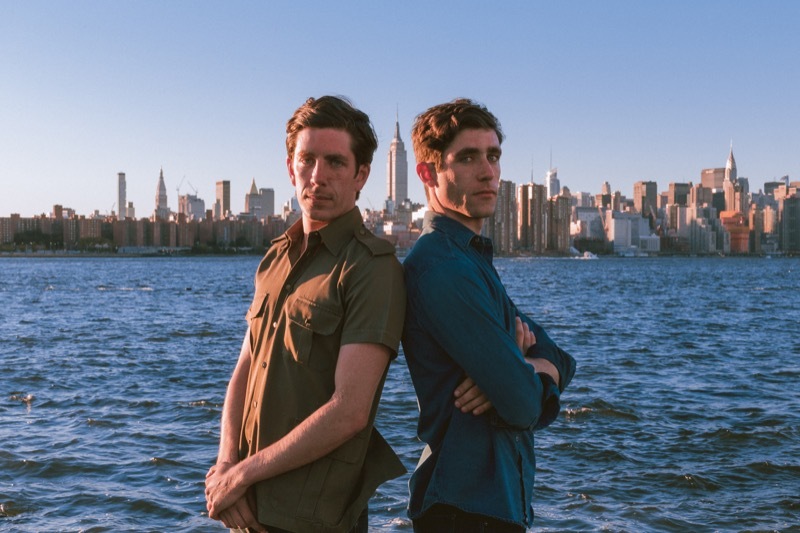 The brothers, who share an apartment in the Bushwick neighborhood of Brooklyn (along with Humza Deas, who has become a friend and creative partner), made another big move in July when they brought a chief financial officer on board. "This is a big shift, from having just the two of us," Disch says. In addition to managing the company's finances, the new CFO is helping to steer and accelerate Ace & Everett's growth. "We have gotten really lucky," says Disch. "Technology has allowed all of these tools to pop up. It used to be, to start a business you had to come from family money, or have some big life savings. But now, something like Kickstarter comes along and lets you raise $20,000, or $100,000. It's an exciting time to be an entrepreneur." And just as they found in Kickstarter a liberating way to launch a business, the Ace & Everett founders are also embracing the communal vibe of a co-working space—the increasingly popular alternative to renting an office. "We work out of a WeWork space in SoHo, [where] we're on the fashion and design floor," says Disch. "We're this little three-person team, but we're surrounded by people we can bounce ideas off of, who share some of the challenges we do, and who we may want to collaborate with in the future. It's awesome. You feel like you are part of a larger community."